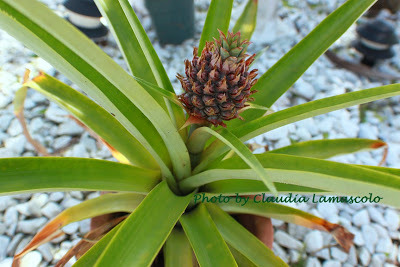 OK, I know your asking why on a food blog would she be posting something on a pineapple plant. Well it's food, looks beautiful when it grows and I happen to be so proud of this one! I've done this for years and I wanted to share this house plant you all can have with just a cut off of the top of a fresh pineapple. I have more than four tops now in dirt of pineapple growing right now. That is what inspired me to show you my plant and tell you how simple it is to do! My Mom showed me how to do this when she moved down to Florida back in the 1990's sometime. They remind me of pine cones growing up North. To this day I still love the look of this and amazed how easy the plant is to grow, they grow bigger in a big pot with dirt or you will have baby pineapples in a smaller one. Pineapple plants are a symbol of hospitality. I had read they are edible and never knew it so they would always be for show (smile). Maybe my readers know more tips? Would love to hear the experts out there on this wondrous beautiful pineapple plants home grown! You will get only one pineapple per plant. If the top comes off easily when plucked it's ripe. They need to ripen on the plant not in the home so make sure you don't pick it too soon! If it gets all yellow it will be the sweetest pineapple on the plant you ever ate. If you live in Florida you can plant directly in the dirt heavily watered will make a bigger pineapple also try using a little bit of Epsom salt in the dirt every three weeks to grow bigger pineapples! Enjoy! It is recommended to let the crown sit in water until it sprouts roots. I don't do that. I pour soil half way into the pot. Add the leafy green crown top. Fill to the top with more soil. Give it a little water. That's it. This plant requires virtually no maintenance. It will grow indoors and I leave it out year long in Florida or you can all summer long in colder area's. This plant is 7 months old in the photo. Hope you have fun with this. Patience is what you need. The ends may start to brown, it's not dying. Leave it alone. I leave mine outside even in rain and cooler weather up to (50 degrees) nothing lower.